After work I got a short bit of bouldering at the Lost City in today. The area is a short drive from Portland and is in the running for some of the best rock within under an hours drive of PDX’s metro. 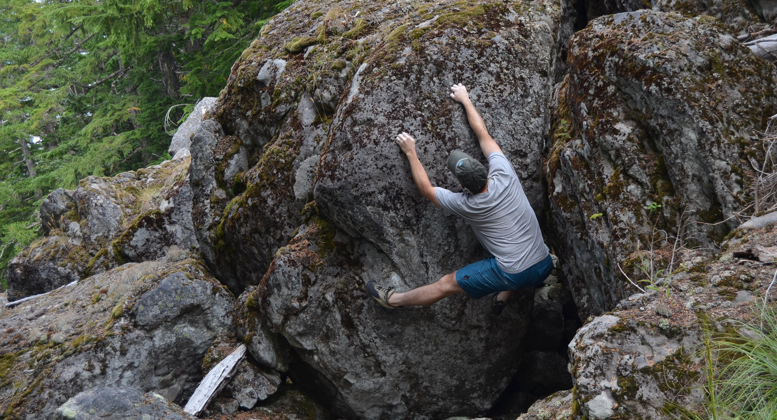 Bouldering in Portland is getting better and better with age. This area is a large area that I have been developing for awhile now. 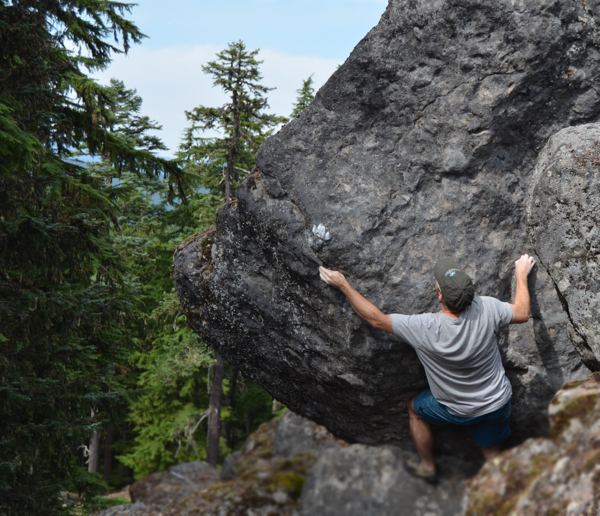 The rock is amazing 4-Star quality similar to some of the best bouldering in Oregon. It’s hard to imagine such clean and amazing stone that I can climb on after a work but here you have this and Boulder Mountain…more about that later. The Lost City is made up of a large number of boulders in a group. I did Shortie, an aptly named short problem when I started. 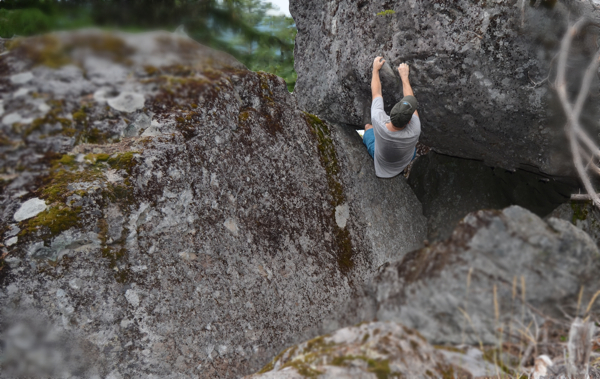 This is a short fun, problem on solid rock with nice pockets. The top is super easy but the crux is in the cave where the problem starts in the lower part of the photo (cut out a bit). The thing I really like about this area is the one and two-finger pockets you get on almost everything. That and a large amount of pretty steep rock. The next problem I did was Hot Chip, another classic that has a V5ish sit-start way under the steepness of the “chip” feature it’s on. The problem is perched about 14 feet up on another boulder making it very high when you traverse out left onto the lip of the chip, but the problem is over once you get there and then it’s a cruise up a nice juggy corner for another 6 feet. I decided to hit some of the cave problems after this, did I mention there are a ton of really nice caves here? Well, in case you were wondering there are. The caves are where you get the real grades at this area. The early evening turned out to be pretty nice but it was looking a little like rain too. Luckily it held out and got on another really fun problem called Flux (sorry ’bout the smudges). This line starts deep under a long roof/cave with a few body lengths of movement before gaining some small pockets at the lip and slightly below it. The problem goes due to some tiny features and edges under the cave, making a low start feasible. The true low, low start makes the problem much harder but is still possible because of the rare features this roof-cave has. It reminds me a little of the awesome roof problems over yonder at Beacon Rocks popular new area which if you haven’t been to is an amazing spot to boulder. Heading out I did one of my favorite sit-starts called Porcelain; yeah, it’s smooth like a toilet. This problem really gives a feel for the baby-smooth rock that you can find and the easy grassy landings where you don’t need a crash pad. 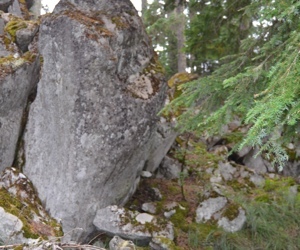 And a lot of the area has these sans-talus landings as much of the boulders are nestled in the pines. Thats all for this trip. I was lucky enough to get on about 15 of the nearly 100 boulders at The Lost City before dark. I’m hoping to head back again later this week or to the nearby Boulder Mountain. I will post about that soon. 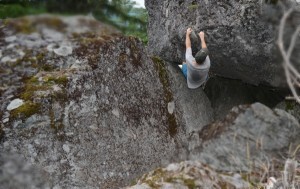 Posted in Pacific Northwest Bouldering Blog, Portland Bouldering and tagged boulder, climb, Portland. Looks awesome, is bigfoot in that photo? Ya pretty sure he is out there somewhere?